For those of us looking for a better-built mousetrap, today there are new, commercially built boat blinds on the market from which to choose. They come in all sizes and shapes, offering the discriminating waterfowler numerous options. Some are simple and very low cost, while others are quite plush and go for a king's ransom. Over the years, I have found that boat blinds all have drawbacks that must be considered before buying one. Some will be very transportable while others will have to be taken down each time after the hunt and stored for the trip home. Some of the commercial boat blinds on the market today allow you to simply fold the whole blind down and head for the dock, but, in most cases, you will pay the price for this added feature. Others have many parts that can be lost or broken and you may end up spending a lot of your spare time dialing the parts department for replacements. For the less patient ones among us, this ordeal is sure to result in an increase in blood pressure level. Hunting dogs in boat blinds is another problem that you will have to consider when selecting one. On more than one occasion I have had my valued retriever break, just as a flight of ducks was coming into the decoys, and proceed right through the front of the blind. This has left me red-faced, sitting in a pile of camo while the ducks flew off. On other hunting trips I have had the dog come up and sit there with his paws on the framework of the blind, looking out while we tried to work a flight of ducks. On still other occasions, I have had them whine so much that it became a problem because they couldn't see out. Yes, boat blinds and dogs can be an interesting experience for us all. The new blinds on today's market have taken this aspect into consideration and have included a dog door or provided for dog blinds to be added. One of the biggest complaints year after year about boat blinds is that, after ordering this new blind, the owner is frustrated because it just doesn't fit properly or they couldn't install it at all. Some boat blinds are simple to install while others will have to be installed by professionals. In order for the new owner to be happy with his new purchase, he or she must do some research and understand the problems associated with the blinds. This is a classic case of 'buyer beware', so, you should ask questions and know what you are getting yourself into. Every hunter's goal is to be able to set the blind up with relative ease and be concealed from the wary eyes of incoming waterfowl in any location and weather condition in which he might hunt. Well, I'm here to tell you that this may not be possible with only one blind. You may have to order a different camo cover for the blind in order to blend into changing foliage as the season goes on. You may need to change the cover when you change hunting location, such as moving from coastal marshes to inland lakes or flooded timber. You will have to determine your own needs and preferences, as they will differ from one part of the country to another. Looking around the industry at all the boat blinds that are offered today can be quite confusing. With this in mind I have chosen to review a cross section from which you can choose. I have tried to select boat blinds that are a fair representation for both the newcomer and the seasoned waterfowler. Some are simple while others are more complex and costly. Some are complete packages while others can be added to as you go along. Some come with the boat while others can be added to your old hunting boat. Let's turn our attention to the boat blinds that are offered today. They can be found in a variety of styles and made from both natural and synthetic materials. The Easy-Up Duck Blind is a patented blind that offers a number of features like easy trailing and ten-second set-up. It will fit almost any boat made today including those with pointed bows. It comes in 3-D leafy-cut in several camo patterns. This is a simple-to-install blind that comes with step by step instructions that anyone can follow. It simply requires measuring the length and width, cutting a couple of galvanized and powder-coated steel tubes and then screwing them together. This blind sets up by means of the unique snap-button connectors. It will even fit narrow boats and canoes and solves the problem some other blinds have — being able to work on V-bottom boats without losing valuable space. The Easy-Up blind will fold flat into a neat package for trailering to and from your hunting spot and, when folded down, it doesn't take up much space in the boat, allowing you to carry more gear. Once at your favorite hunting spot, all you have to do is pull the blind up and lock it into position. This blind has a unique gate assembly that allows one side of the blind to be open without affecting the other side. The gate feature not only makes it easier for you to get in and out but, it is also very dog-friendly in that it allows your canine partner to see out. This feature also aids your dog when he is required to enter or exit the blind. This is a nice blind and, at a very reasonable price, it will solve a lot of problems for those of us that have small boats or boats with V bows. You can order one of these fine blinds through Herter's, Cabela's or other leading catalogs. If you would like more detailed information on the Easy-UP Blind write to FLYWAY SPECIALTIES, 2434 Mcgarrah Road, Ochlocknee, GA 31773, or call 888-203-7781 or 229228-1787. Beavertail offers one of the finest boat blinds that I have used this season, as it was easy to set up, durable and extremely effective. I have trailed it on the new Legend Craft 17 and used it in several states, from North Carolina to Florida, and it has allowed us to limit out. It has proven to be very adaptive and a pleasure to shoot from. This blind was designed so that you could use it with conventional outboards as well as Beavertail's fine line of mud motors. It covers the whole boat and has three shooting ports that have flaps that can be fully or partially closed, depending on your situation. The blind also has vegetation pockets that can be used to help conceal the boat and break up the outline. It doesn't stop there as the outside cover is constructed out of 500 denier cordura material that has a polyurethane coating for waterproofing and is available in Advantage Wetlands, Natural Gear, Real Tree Hardwoods, Shaddowgrass, and Skyline Fall Flight patterns. The total weight of the blind is only 47 pounds and, when it is in position, it only stands some 27 inches above the gunnells of your boat. While traveling to and from the hunting area, the blind rides on the port side of your boat in a snapped-on water-resistant cover. The blind only takes about 20 seconds to set up once you reach your hunting area since it just folds over the boat. At the end of the season all you have to do is loosen two stainless bolts, lift the blind off, and you can store it away for opening day. This fine blind is also dog-friendly because they have added two dog doors — one on each side of the blind — making it easy for your dog to get in and out. One is located in the stern and the other is located in the bow and each has Velcro, making it adjustable. This makes it easy to use your dog ladder and keeps your dog out of the way in a safe place in the boat. Beavertail has also offered this blind in two models to fit almost every boat on the market from 14 to 20 feet in length. The two different models will accommodate boats from 30 inches wide to those extra wide boats that exceed 82 inches. The blinds have been built by hunters for the waterfowler and are excellent, no matter where you live. I have hunted from one of the Pop-Up Boat Blinds on several occasions in different states and found the construction to be rock solid and trouble-free. This blind rides on the gunnel of your boat and takes only 10 seconds to pull up and over the boat. It has flapped, net-covered windows allowing excellent visibility; yet, it keeps you hidden from incoming ducks and geese. When you are ready to pick up a cripple, just drop the blind down and it is out of the way, allowing you access to the sides of the boat. When you finish your day's shooting, drop the blind, drive up the highway and the blind is ready for your next outing. Duck & Goose Hunting Specialties has designed two models — one for boats 14 to 15 feet in length and the other for 16 to 18 foot boats. Upon request, they can also build a custom model for larger boats. The Pop-Up Blind has made it very simple for the dedicated waterfowler as this outstanding blind is all that you will ever need. For years Warren Coco has been producing Mud Motors and duck boats, but now has offered the waterfowling community a new concept: a full duck blind that is self-contained. It is like having a Hilton Hotel in the duck marsh. 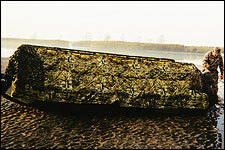 This fine duck blind/duck boat combination was designed for the hunter that was looking for it all. It can be trailered and, by simply adding a Go-Devil motor, you can run to where you need to hunt and never have to do a thing. These fine blinds can be outfitted with all the comforts of home such as heating, stoves, lighting, custom seating, and much more. The hull is constructed of marine grade aluminum and measures 16 feet long by 7 feet wide. It has a shooting platform mounted on the boat that measures 9 feet long and 5 feet wide. The shooting house has a three-foot roof and a two-foot shooting porch. You can order this blind or have a custom blind built just for you by calling Warren Coco at 888-490-3254 or writing to Go-Devil Manufacturing of Louisiana. Inc., 18649 Womack Road, Baton Rouge, LA 70817. Don't forget to ask about all their other fine products and you will see why Go-Devil has been a mainstay in the waterfowling industry for over 25 years. The Avery Quick-Set Blind has been around for a few years and has been used in all parts of the country. This lightweight and durable blind is made of thick-walled aluminum square tubing that is adjustable. Avery makes their Quick-Set blind so that it can be shipped via UPS right to your doorstep, ready for assembly on your boat. From start to finish, it takes about one to two hours to assemble and fit the Quick-Set to your boat using only simple hand tools. Unlike other blinds, the frame of the QuickSet folds straight down. They have used 1000 denier cordura wind-blockers on the inside with the exterior camo netting made out of leafy-cut Cerex. They also offer rain tops that fit the double flip tops. Mud Buddy Manufacturing has produced two different duck blinds that will work in marsh or big water conditions. Their Fastgrass Blind was designed for duck hunters seeking a blind that didn't look like a blind and would blend into low marshes. It takes up very little room, is attached to your boat by bolts, and features a frame that will fit boats from 12 to 20 feet long with beams up to 50-inches wide. It is constructed of metal tubing that is covered with all natural Fastgrass, a woven palm leaf mat, that with proper care, should last for 3 to 5 years. There are swivel brackets, both front and rear, that allow the side frames to fold up and down for hunting. The top of the blind has a shooting slot that allows you unrestricted movement.